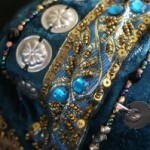 I wanted to start this post with the finished bra, because it would make what follows a bit more palatable. Yes, the results are gorgeous, but yes, it will require a bit more work than normal. I won’t cover adding the straps and sides, as the process is fairly similar if not identical to what I described previously for the black and burgundy bra, the dress, and even, a bit, for the belt: use a sturdy base, cover with the fashion fabric, attach. 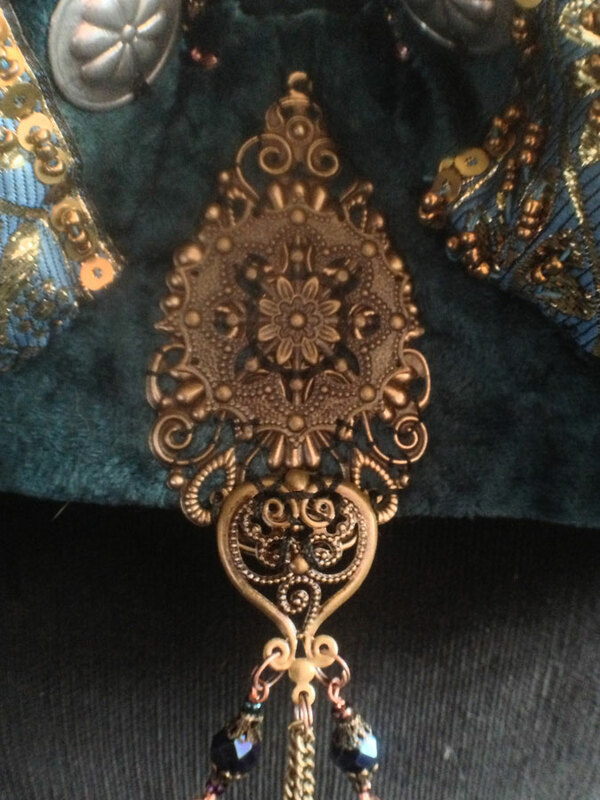 The “new” bit here, and what warrants the extra post, is the beading. And I am not talking about the embroidered beads, those were covered before, and there are other ways that you could do it. I am talking about the dangles. As a big girl, I’ve refused to have dangles before, because, I thought, they would attract the eye to my stomach, and of course we’ve always been told that is BAD (yes, in bold and capital letters). However, we are dancers, and we practice a form that works better for smaller audiences, and up close, with small, precise moves that sometimes are so delicate to barely be seen… But when parading or performing at fairs, all the typical trappings of our costumes do start paying off: the dangles, the tassels, the ruffles, the drapes, all serve to amplify our moves, because the guy standing 3 metres away from you might not be able to notice your amazing Arabic shimmy, but he *will* see that you’re moving because the tassels and falls are moving, and his brain will fill in the blanks. This time, I wanted to do something special, and I was encouraged by the lovely combo of beads I’d used for the bra, and decided I wanted some more beads strung, but because of the nature of our moves, I needed something a bit more sturdy. Enter the copper wire. 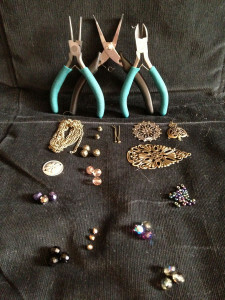 I’d done jewellery before (why, yes, you *should* be surprised!) so I had all the necessary tools. They are not many and can be obtained cheaply, I’ve seen basic sets on Ebay going for a fiver. Places like Hobbycraft sell ergonomic versions that are much pricier, if you’re going to be doing a lot of it, you might want to consider it… because warning: beading CAN and DOES hurt. Among the tools you will see 2 types of pliers: round nose and bent, and a wire cutter. I also used three different filigrees to construct the focal piece, chain to create the central dangles, some bead caps, head pins, and an assortment of czech crystal fire-polished beads in different colours and sizes. I went with a lot of faceted stones because they do catch the light better, and that helps making your costume sparkly, and with AB (Aurora Borealis) finishing because that tends to add an iridescence that is quite attractive, and would contrast quite nicely with the deep jewel teal of the base. For assembling each strand, I created a mock-up of the finish set using sturdy thread, and decided to split the beads in groups of three, that you can see in the photo on the right. I used the wire to create a loop that I then wrapped to secure it, put the beads in with just enough room so they could move without being too loose. The wrapping of each loop is *vital*, because these dangles will take quite a bit of punishment, with turns and shimmies, and the wrapping will prevent the loops from becoming undone. And this is also the reason why I used wire, and didn’t just use elastic or heavy-duty thread like I used on small beaded tassels before. 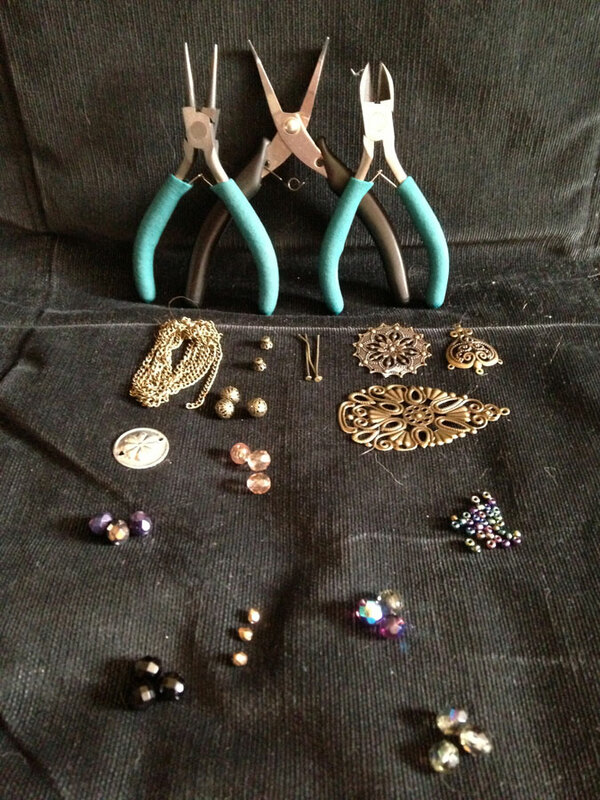 Yes, this might just be over-engineering, but I’d rather do the work once, and not have to repair it, or waste time going over it for half an hour before and after each use because there’s a chance that something might be loose or worn, the beads will fly out, and poke someone in the eye. I am not going to go into the wiring detail, there are probably plenty of tutorials on YouTube that should explain things clearer and more in detail than I can go in here, done by people who do jewellery as their trade. Finally, I assembled a centrepiece out of 3 different filigrees. 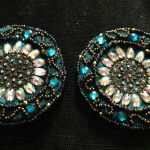 You can use glue to get these together, however, I used thread to sew them together and onto the bra. If you’re lucky enough to find a piece that you love, good for you; I wasn’t that lucky so I used what I could. I added a central dangle to it using the chains, some more beads, bead caps and the head pins, and attached the beads to this central piece, and to the bra. If I had to do it again, I would probably create a slightly smaller central piece, as the bottom bit can poke into my tummy if I’m contracting too much for tummy rolls, for instance. 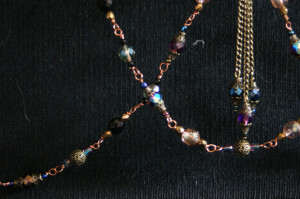 And I would probably create the beads with lobster clasps so they can be removed at will (and used elsewhere!). But those are considerations that have more to do with your costume planning, so they don’t have to be exactly the same. And anyway, the piece was nice enough to get a *lot* of compliments from people, so I’m happy enough as it is!